Straight Hair made Simple! Straightening your hair every day can be a real pain, especially if you've got long, thick or unruly hair. Activehair aims to take the pain out your haircare with this easy tool that does it all. Straighten as you brush – brush as you straighten. Hair straightening has never been easier with this new, revolutionary, one of a kind tool that saves you all of the time and effort. 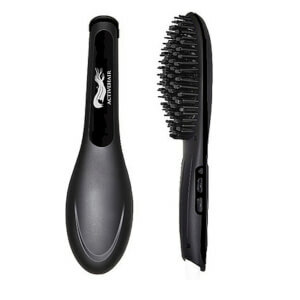 It's a hair brush, that straightens your hair as your brush. As you stroke the brush through your strands of hair – they will become as straight as if you had gone over each strand 3 times with your straightener. The brush looks like any normal hair brush but actually contains a heated ceramic plate under the head of the brush that will transform frizzy or messy locks into sleek, glamorous hair that will be the envy of all. Fast, easy and effective – you'll wonder how you got by without it before.